In my classes and conversations with many home cooks and those eager to become home cooks, I hear the same repeated request: Healthy. Easy. Meals. So here’s one of my favorites that meets this criteria and then some. As a sheet pan supper, you’ll only be washing one pan after you stuff your face with wholesome goodness. And since the incredible edible egg is the star protein, equally acceptable for breakfast, lunch and dinner (and of course BRUNCH), it’s easy on the wallet. The chili maple glaze turns the squash into crunchy on the outside, creamy on the inside, candy that even squash resisters can’t stop eating. 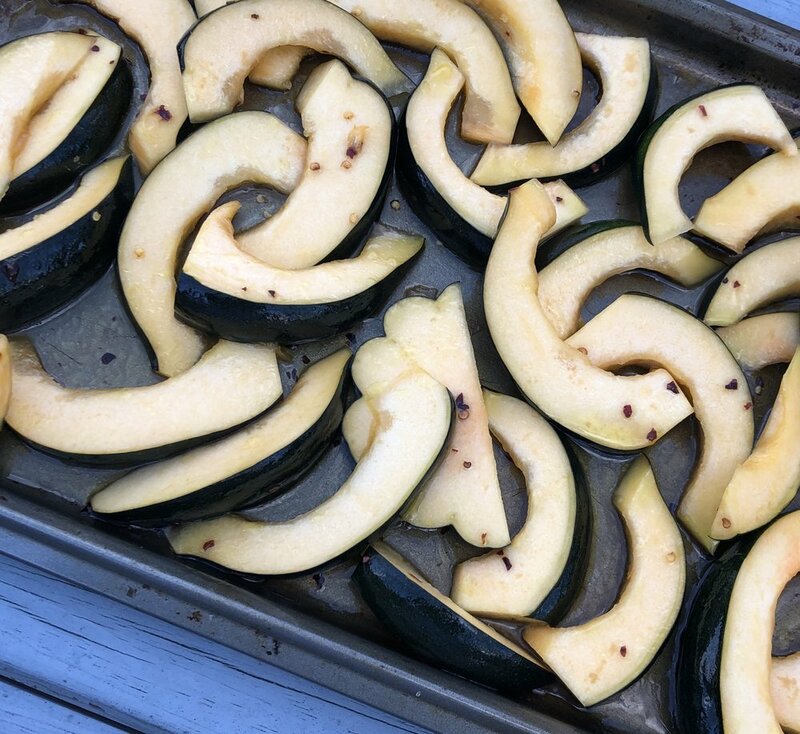 You can use any type of squash, but I find delicata or acorn work best in this dish, since the roasted skin is deliciously edible, upping the convenience and health factors (thank you, fiber). If butternut or another variety of squash is more readily available to you, go for it. Whichever you use, cut the squash into symmetrical crescent-shaped slices that can be ingeniously arranged to contain a cracked egg. Make this for dinner on a weeknight. Make it for brunch and impress your friends. Make extra and put the leftovers inside a taco. 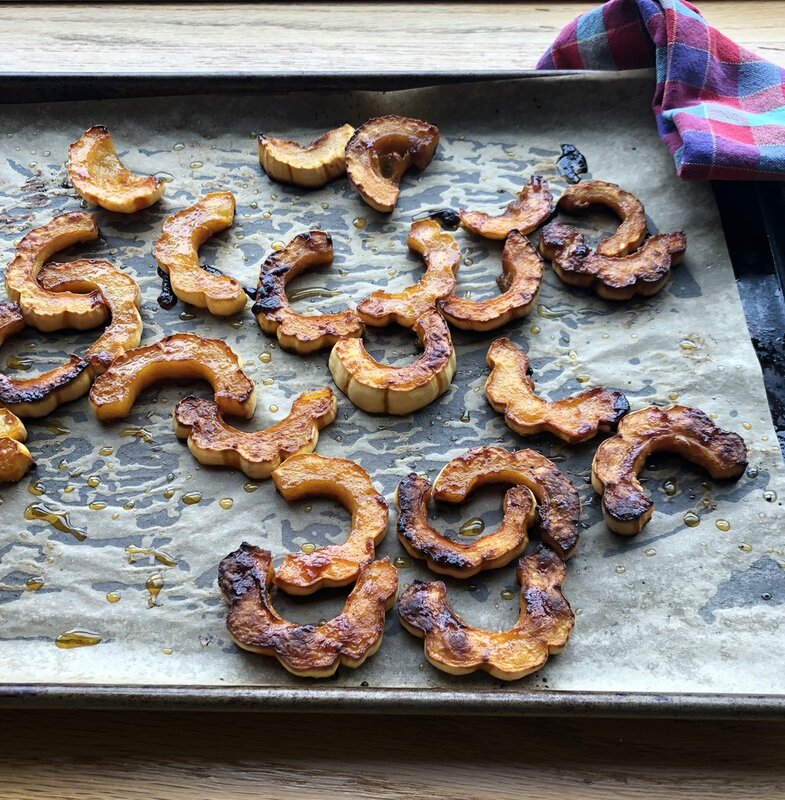 Acorn squash cut into crescent shaped slices and tossed in chili maple glaze before roasting. 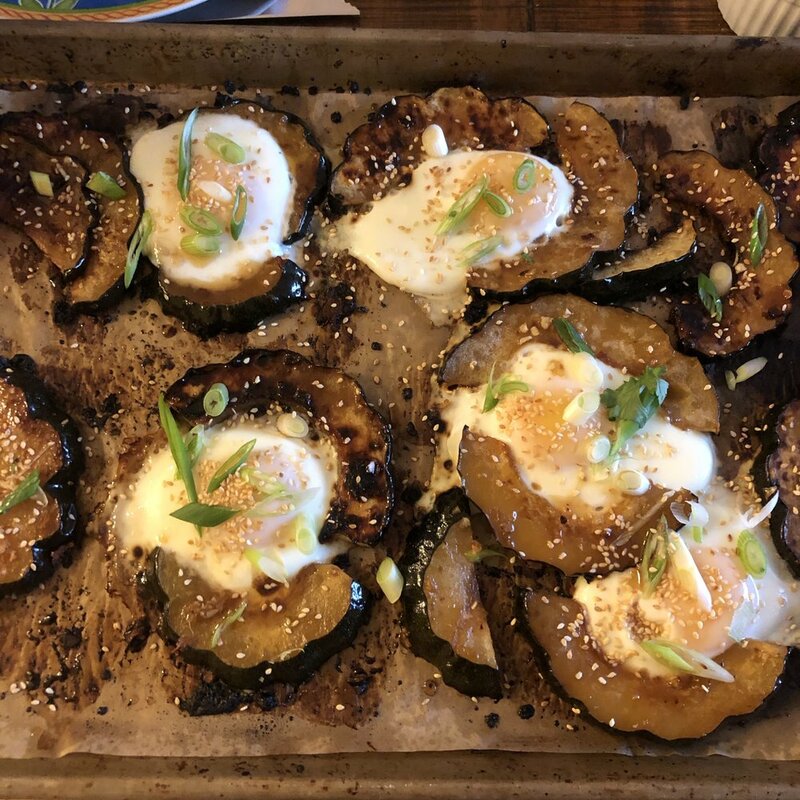 Delicata squash after roasting, ready to get brushed with more glaze, and arranged for the eggs to get cracked on top. Garnish with sesame seeds, sliced scallions and more glaze. Preheat the oven to 400 degrees and line a baking sheet with parchment paper. In a large bowl, whisk together the maple syrup, sesame oil, grapeseed oil, apple cider vinegar, tamari, garlic, ginger, and chipotle chili flakes. Season the squash pieces with salt and add to the maple syrup mixture. Toss to coat. Set aside for 10 minutes. Spread the squash in a single layer on the parchment lined sheet tray, reserving the extra glaze. Bake 25-30 minutes or until it is golden brown on the underside. Remove the pan from the oven, flip the squash, brush with additional glaze and return the pan to the oven. Bake another 10-15 minutes or until squash is browned on both sides. Arrange the squash so that two half moons create a circle with a well in the middle. Drop one egg into each well. Season with salt. Return the pan to the oven and bake 7-8 minutes or until whites are solid and yolks are cooked to your preference. Garnish with toasted sesame seeds, scallion slices and more chili maple glaze. Serve immediately.